Our actions represent our life choices and beliefs. For this reason, we produce a flour that interprets our consumers’ lifestyle. Petra helps us rediscover the importance of carbohydrates for a healthy and flavorsome everyday diet. Petra offers us the nutrients and the technologies to transfer the energy of wheat to our table. We achieve all this by selecting and milling only top-quality wheat grains. In our school, we organize workshops and courses that help understand yeast activity and how to prepare the dough for bread, pizza, fresh pasta and other bakery products. Petra takes the milling tradition of our family into the future. STABLE FLOURS THROUGHOUT THE YEAR. At Molino Quaglia, we focus our attention on the stability of flours. Petra is the most stable flour on the market, which means that it performs at its best in different kinds of dough. G’trainers use Petra every single day in our School. For this reason, they can give you technical support and practical advice on how best to use these flours. Milling technology plays a vital role in Molino Quaglia. We are always looking for new processes and innovative solutions in order to improve the performances of flours and guarantee perfect doughs. In our mill, we develop new technologies in order to make the unparalleled quality of Petra flour tangible and visible. Molino Quaglia is the place “where flour becomes art”, as our motto says. We strongly believe that it is essential to combine our high quality ingredients with advanced technical skills in order to obtain perfect bakery products. Petra flour can be sustainable, conventional or organic as a result of different agricultural techniques. It is milled using the unique augmented stone milling process or cast-iron cylinders. In both cases, our industrial process guarantees the maximum food safety achievable today and an easy-to-use flour. Petra is chosen by the best bakers, pastry and pizza chefs and cooks because it remains stable over time and has a rich and distinctive flavor. The number of restaurant options has significantly increased over the last decades together with the widespread use of ready-made meals, resulting in a reduction of the amount of time spent on food preparation and cooking at home. For the milling industry this new trend resulted in the loss of value and consequently the quality of raw materials, especially flour. Moreover, the agricultural techniques have been adapted to meet the needs of big multinationals in the sector. 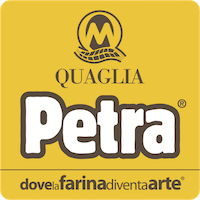 The project behind Petra started in 2006 in Molino Quaglia. The Quaglia family realized that there was a need to reaffirm the importance of flour, the most common and simple ingredient of the human diet, in order to ensure a healthier diet, taking also into account the nutritional and climate change aspects. Starting from the second post-war period, flour has slowly lost its nutritional values and the characteristic properties given by the different kinds of seeds used. This has led to a uniformity of the quality, the color and nutritional values of the flours on the market. Petra is a unique flour that stands out compared with other products available. Today, Petra presents a wide variety of flour that guarantees high performance and distinctive texture, color and flavor. iL LABORATORIO is the academy where you can improve your skills and invest in your business, your staff and in your products. iL LABORATORIO offers you top quality training courses, real knowledge and the opportunity to exchange ideas and opinions with like-minded professionals. The best quality is never achieved by chance. iL LABORATORIO is organized and run by PETRA milling company, a unique example in Italy. It hosts Petra’s R&D Department and it is used to divulge knowledge about flour, yeast activity, doughs, but also the production, promotion and sale of artisanal bakery products. For over ten years, the academy has been organizing different courses: Università della Pizza, Accademia del Pane and Pasticceria Dinamica. But it also organizes other thematic courses for bakery, pastry and pizza professionals. To conclude, iL LABORATORIO hosts two annual symposiums: PizzaUp (the annual Technical Symposium on Italian Contemporary Pizza) and Pastry Best ( the Technical Symposium on Italian Contemporary Pastry). These events see the participation of Italy’s biggest culinary and wine personalities. Flour is often seen as an easily interchangeable ingredient . People use inexpensive and anonymous flours in their bakery products because they believe that the choice of a cheap flour will not influence the end result. Nothing could be further from the truth. Using the wrong bakery techniques and saving money on flour lead to a mediocre result, a waste of money and time. -ing form expresses an idea of action and movement. This term reflects the active attitude needed by a company in order to promote and sell its products and be competitive on the market. Petra focuses its marketing strategy on the quality of the products. It is not important the reputation or notoriety of the baker because the results will speak for themselves. In order to achieve top quality bakery products the choice of the right type of flour is essential. Flour is a simple and common ingredient, but it makes all the difference. Petra’s marketing strategy emphasizes the importance of a careful flour choice, promoting only the highest quality ingredients.